Zingiber officinale (Luya) is a blood circulation enhancer, a hair bulb nutrient and stimulant. In combination with Aloe (Aloe Barbadensis), it is an effective hair grower and falling hair preventor. It has antiseptic and very powerful anti-inflammatory properties. Moringa oleifera (Malunggay) contains thiocyanate which has high affinity to the hair bulbs and prevents falling hair. It strengthens the immune system, restores skin condition, controls blood pressure, relieves headaches and migraines, manages the sugar level, reduces inflammations and arthritis pains. Panax ginseng (Ginseng) has been known for more than 2,000 years for its “nourishing” effect on skin and scalp and is believed to stimulate hair growth or at least prevent falling hair. It also aids in the blood circulation. Centella asiatica (Takip-kohol) improves blood circulation and fights environmental aggression, free radicals and oxidation and thus naturally promotes hair growth. Aloe barbadensis (Sabila) is a hair conditioning agent and hair growth stimulant, contains an enzyme that stimulates new hair production, increases the tissue from a cellular level and regenerates throughout all levels, has anti-fungal, anti-viral, anti-bacterial and anti-inflammatory properties which are helpful in fighting against androgenetic alopecia and hair loss. Virgin Coconut Oil (VCO) upon skin contact clears away dirt and improves blood circulation, stimulates hair follicles to promote hair growth. 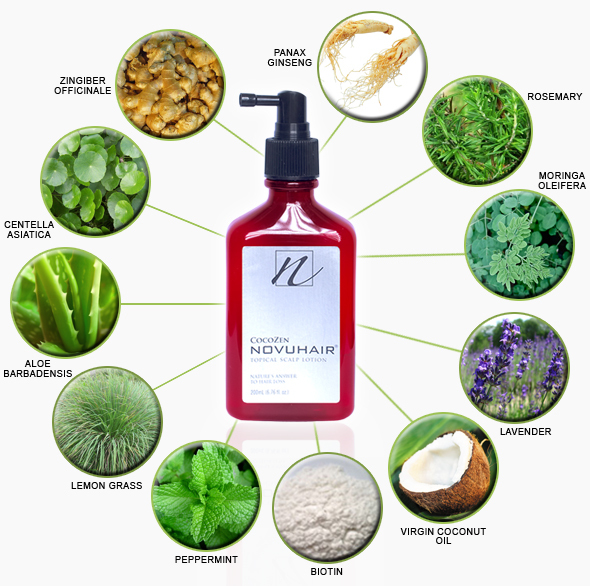 It controls dandruff, moisturizes scalp, and brings out healthy hair. Peppermint has been shown to retard the growth of many varieties of bacteria and fungi. It has a particularly relaxing effect on muscles. Because of its cooling properties, it may also relieve itching when applied topically. Peppermint is used for its stimulating, antiseptic and refreshing properties. Lemongrass (Tanglad) helps clean skin/scalp pores leaving your hair healthy and refreshed. Lemongrass is known for its ability to aid in digestive health, pain relief as well as for its anti-bacterial and anti-fungal properties. Rosemary has the properties that stimulate hair growth, disinfect the scalp, increase blood circulation and improve hair health. It help combat dandruff, a source of hair loss. Rosemary has the ability to penetrate into the hair shaft and decrease capillary permeability and fragility. Lavender helps relieve itching. It also has the properties to stimulate hair growth, increase blood circulation, improve the hair’s health, and combat dandruff. It has the ability to remove nervous tension, relieve pain, disinfect scalp and skin and treat respiratory problems. Biotin is a “hair-and-nail vitamin.” Biotin is a member of the B-vitamin family needed for healthy hair and skin, and prevents hair loss. Using biotin for hair growth, significantly reduces the chances of hair loss. It nourishes and strengthens hair. Phyllantus emblica (Nelli) is an accepted hair tonic for nourishing hair and scalp thereby promoting black and luxuriant hair growth. It is excellent for preventing hair graying due to its rich tannins. It has dual benefit of preventing hair loss and stimulating hair growth. Dexapanthenol (Vitamin B-5) is an important hair and skin nutrient that supports rejuvenation and longevity. For better growth of hair, B vitamins are necessary. Vitamin B5 has been scientifically linked to help prevent hair loss and hair graying.